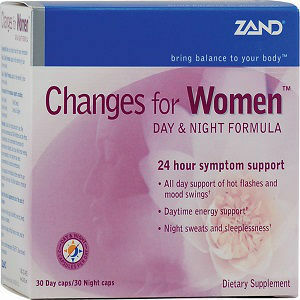 Zand Changes for Women contains separate day and night formulae to provide the body with 24-hour support. The day formula reduces hot flashes and mood swings and also provides energy, while the night formula alleviates night sweats and sleeplessness. Folic acid – Reduces hot flashes and keeps hair healthy. Vitamin B12 – Reduces moodiness and anxiety. Pantothenic acid – Relieves anxiety and fatigue. Gamma-Aminobutyric Acid (GABA) – Relieves hot flashes, anxiety, sleeplessness and stress. Alpha-Lipoic Acid – Reduces hot flashes, night sweats, mood swings and maintains bone density. Rhodiola seed extract (Rhodiola rosea) – Improves mood, energy levels and mental clarity. Also reduces pain associated with uterine cramps. Black Cohosh (Cimicifuga racemosa) – Contains isoflavones, which mimic the properties of estrogen and reduce menopausal symptoms like hot flashes, night sweats, mood swings, irritability, loss of bone density, vaginal dryness and atrophy. Green Tea (Camellia sinensis) – Reduces intensity of hot flashes. Magnesium oxide – Helps absorb calcium and maintain bone density. 5-HTP – Calms down the mind and body and allows you to sleep better. Also keeps weight in control. Wild yam root – Contains a precursor of estrogen and is known to relieve hot flashes and night sweats. Peony alba root – Restores hormonal balance in the body. Motherwort herb – Simulates estrogen’s properties and reduces symptoms of menopause. Passionflower extract – Has sedative properties that helps reduce sleeplessness and anxiety. It also purifies blood and reduces blood pressure. 1 day formula capsule is to be taken half hour before breakfast and 1 night formula capsule half hour before dinner. May interact negatively with MAO-inhibitors or barbiturates. This supplement is also not recommended for people with hypertension or diabetes. The listed retail price for bottle is $20.89, but it is available on Vitacost for a discounted price of $12.99. Each pack contains 30 day and 30 night formula capsules. Zand offers an unconditional 30-day guarantee, where customers can return all unopened and one opened bottle of the supplement for a full refund of product cost less shipping and handling charges. Zand Changes for Women comes in a unique dual formulation catering to the body’s different needs during the day and night. Jackie Horowitz	reviewed Zand Changes for Women	on July 4th	 and gave it a rating of 2.5.